Good morning!! Every month we'll be bringing you inspiration for the Die of the Month; today is our Die of the Month Blog Hop!! The Die of the Month is like a "swiss army knife" you can manipulate it to do a variety of things. At the very least you can do a card and normally you can use the pieces and parts for cards and other 3D items. The Creative Team has joined in for everyone to give you their spin, in their style. We hope you'll see something that resonates and inspires you. If you are new to our blogs, the Die of the Month is an exclusive die Becca has designed for Spellbinders - it is called Softly Spoke'n Flip and Gatefold Die. 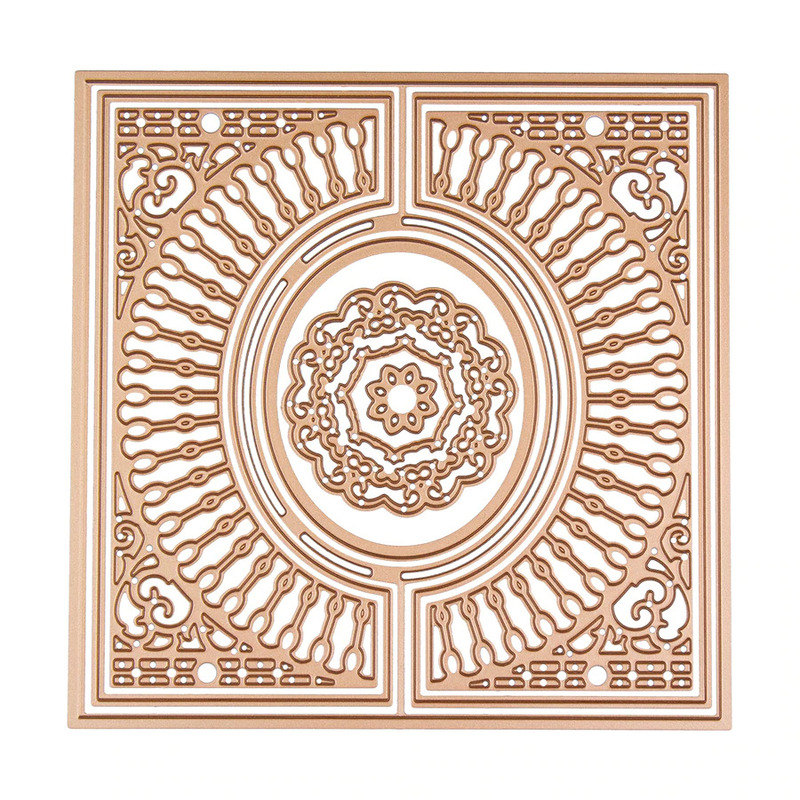 This particular set has 9 dies and they can be used to make a background, a gatefold card, a tent card and the individual dies in the set can be used for many things. If you want to find out more about the Club - prices, how you sign up and what's included, please look --------; HERE. If you missed the introduction and want to know more about what inspired the Die of the Month Club, look -------;HERE. I love to make money cards so using the beautiful die this month to create one for a birthday coming up in the family was just perfect. I created the fold over part of the die for the front and made a small pocket inside to add the money for the gift. And behind that i added another layer for a sentiment. 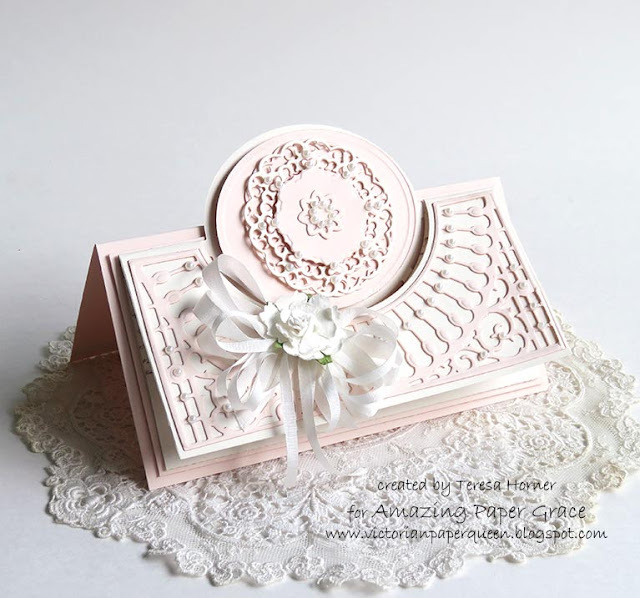 Each layer is carefully matted with off white and a light pink to make the beautiful details in the die really shine. Here is a peek at the inside and the pocket that i created. The die has a fold on it so i created a small one to fold up for the money pocket. 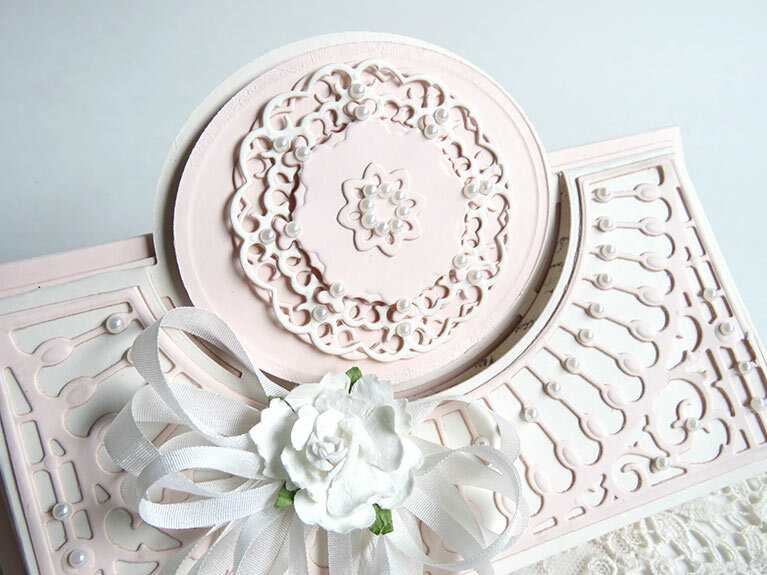 I really love the center pieces in this set and this will be fun to mix with other dies. This shadowbox frame i made for a family friend of his grandparents. It's such a gorgeous picture and deserves to be out on a table to admire. Imagine doing this for a wedding gift, wouldn't that be nice! 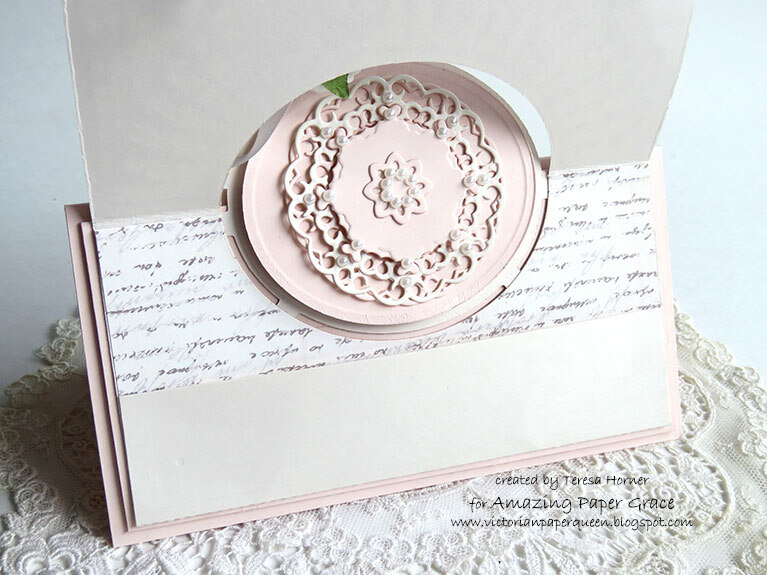 Papers: for both projects you will just need basic card stock in ivory, light pink and some gold. 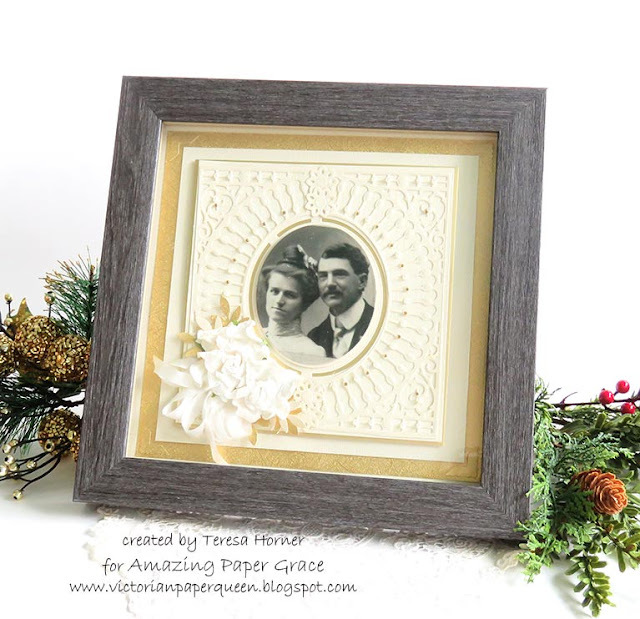 Thanks so much for joining us for the Amazing Paper Grace December Die of the Month Blog Hop. We can’t wait to see what you make with these exclusive dies – be sure to post your creation on Instagram using the hashtag #AmazingPaperGraceClubKit. Both of your creations are lovely! Two gorgeous creations, Teresa. 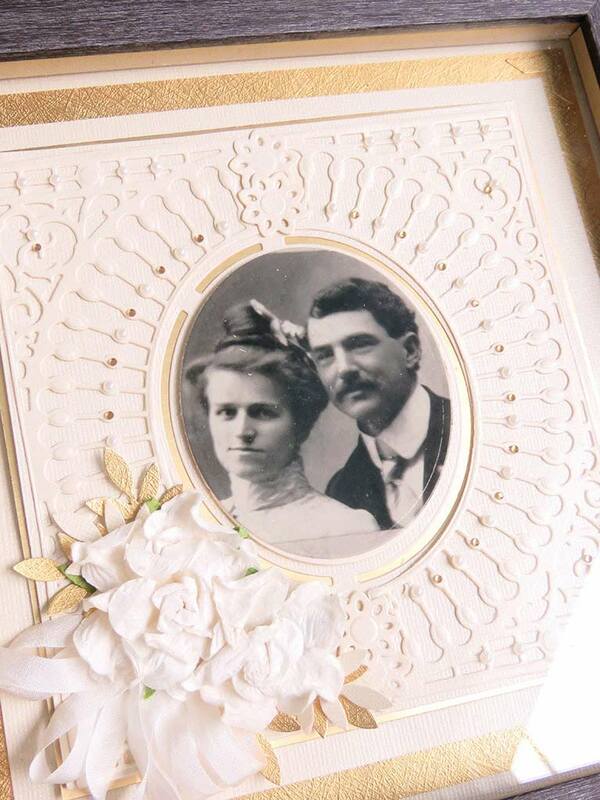 The new die works wonderfully as an heirloom picture frame! Stunning projects - so, so, so in love!